The first gold dredge in southern Oregon and one of the first in Oregon history began operation in the spring of 1900 along the banks of the East Fork of the Illinois River near the community of Takilma. The following story tells why this site was chosen, how the 100 foot-long dredge was shipped from Portland to this site, and why, despite the rich prospects of gold, the dredge was unable to succeed. All of the locations mentioned in this story are on private land and not accessible to the public. 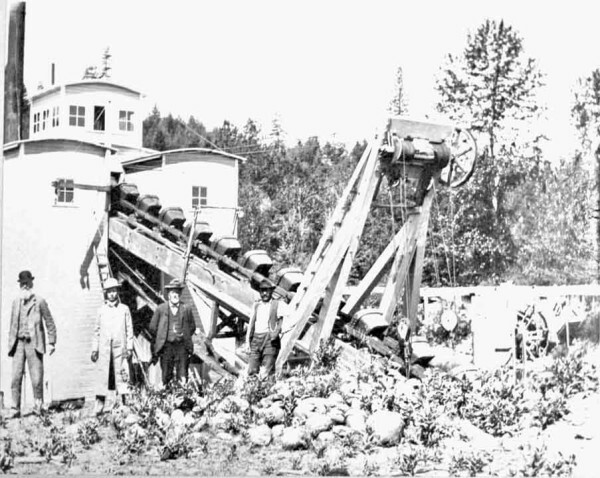 The story of the first gold dredge in southern Oregon begins in the mid 1890s at a place called the Chinese Derrick Ground, a mining operation located on the flats at the bottom of Sailor Gulch, the place where a group of sailors discovered gold in 1852 and sparked a gold rush that resulted in the establishment of the town of Waldo. The upper part of the gulch was mined extensively in the 1850s and it was suspected that the flats at the base of the canyon contained substantial gold. However, the work of moving river rock in an area that constantly flooded proved too labor intensive and the area was left untouched as miners moved on to easier diggings. Around 1890, a Chinese miner by the name of Wong Back Fong, was awarded a 99 year lease to mine the Sailor Gulch flats. Generally, Chinese were not allowed to own claims but the many years of disinterest in this area made it possible for Fong to own the mining rights (7). An arrow shows the location of the pond at the base of Sailor Gulch, part of which may have been excavated by Fong. Another small pond can be seen between the L and C in Sailor Gulch and may have been the small reservoir built by Fong to store water to run his water wheels. Both sites are on private land and are not accessible to the public. The machinery used in Fong’s mining operations was almost entirely made of wood and was constructed by the Chinese who operated the mine (9). With this crude equipment, Fong was able to excavate a 40 foot-deep pit and separate gold from the gravel hauled out of the pit. Fong faced some challenges to make his mining operation work. The pit was located next to the river so water seeped in constantly, and did so at a much higher rate during winter months. This restricted Fong’s mining work to the summer months when the river was low and two pumps powered by water wheels were used to remove water during the dry season. Getting a supply of water for his water pumps during summer months was a challenge because the stream in Sailor Gulch was seasonal and had no water in the summer. Fong constructed a small reservoir above his claim to collect water during the rainy season and to operate the water pumps during the summer (9, 16). A third water wheel was used to power a small derrick to lift buckets of rock and gravel out of the pit. On account of the limited power of the wheel, Fong was unable to raise rock from a depth more than forty feet and, consequently, could not mine below this level (16). 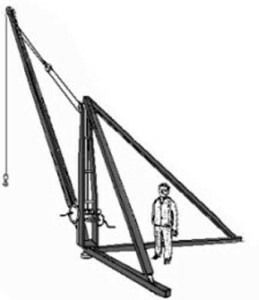 A simple derrick functioned much like a crane. Fong’s derrick used a water wheel as a power source to lift buckets of rock on the derrick he built. In an effort to determine the depth of the claim’s gravel, a shaft was excavated in the bottom of the pit to a depth of fifty feet, which gave a total depth at this point of ninety-one feet. At this depth, quick-sand was encountered and the shaft abandoned. (16). They were unable to go deep enough to hit bedrock. Fong and his crews worked on this claim for about 7-9 years and through that time the extent of their operations amounted to a pit about one acre in size and forty feet deep (13). As Fong excavated through the gravel beds, he found values of gold that ranged from ten cents per yard to $2.75 and higher depending on the depth and strata (10, 16) (this is equivalent to about $7.50 to $215 per yard in 2011 gold prices). 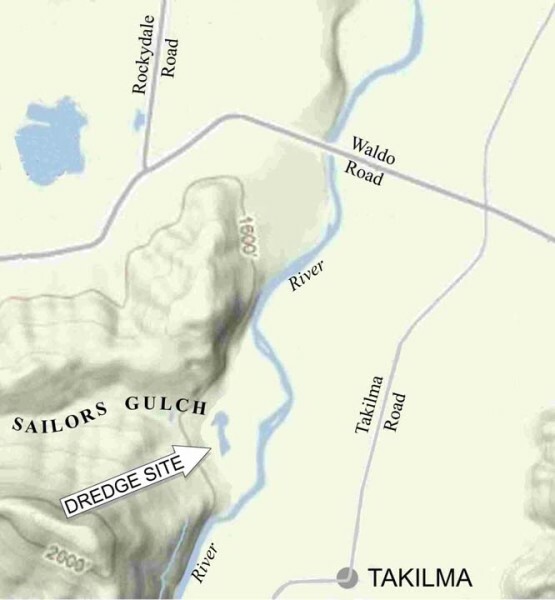 Considering that in the 1890s, dredges in New Zealand were able to make a profit in gravels with only two cents a cubic yard, the possibilities generating substantial profits from a dredge at Sailors Gulch were substantial (10), especially in a pit that naturally filled with water. At about the same time, Fong was approached by another group of businessmen who had formed the English-Canadian Company and presented him with a proposition to purchase his mining rights. Fong initially asked for $20,000 but concerns about legal battles with the claim jumpers played a role in his decision to reduce the price to $14,500 (5 – p378 and p615). What Fong made from his claim during the nine years he worked on it, no one can tell but after returning to China he became a banker in Hong Kong reputed to be worth $250,000, all of which likely came from the flats of Sailor Gulch (16). Fong’s mining venture made him a rich man. Soon, a mining dredge named the “Josephine” would take his place and begin a story with a less than happy ending. The first gold mining dredge in southern Oregon (10) was set up in the fall of 1899 at a mining claim near the historic town of Waldo and despite the spectacular promise of success, this massive machine was only able to operate for one season before the owners became entangled in litigation. During the squabble that followed, the dredge lay idle and eventually capsized (3). A group of men stand in front of a gold dredge that is believed to be the Josephine. The equipment in the background and clean buckets hint that the dredge may have been under construction. Josephine County Historical Society collection. The dredge was about 100 feet long and probably 30 feet wide and used a chain of buckets to haul gravel into the hull of the boat where the gold was extracted. The assembly of buckets cut into the gravel beds much in the same way as a chainsaw into wood except the buckets lifted up rather than cut down. These were called bucket-ladder dredges. Bucket-ladder dredges were first put to use in New Zealand in 1881 and were brought to California in 1896 (4) where success probably played a role in the eventual interest in using them in Oregon. 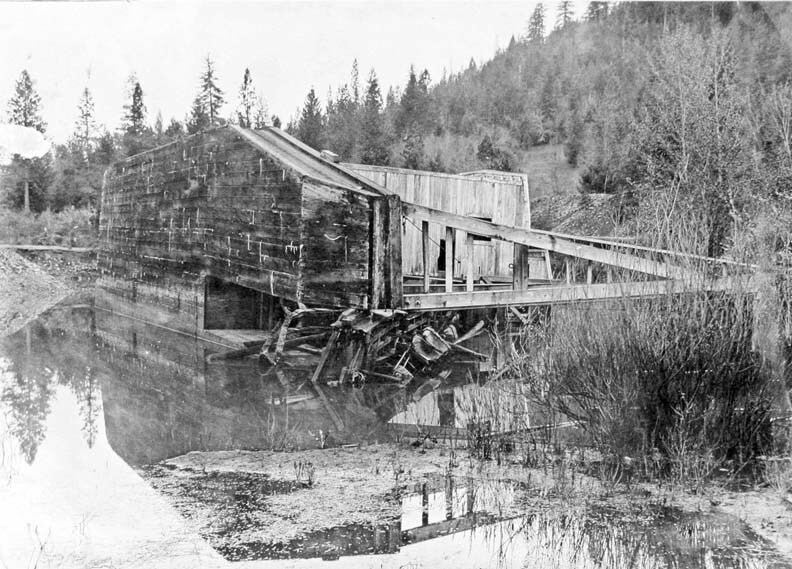 The dredge at Waldo was made by the Hammond Manufacturing Company in Portland and shipped to Grants Pass by rail in September, 1899 where it was hauled, piece by piece over dirt roads by horse drawn wagons to Waldo, a distance of about 50 miles (8). The boat was assembled during the winter months and began operating in early April, 1900 (11). It was named the “Josephine”. The machine no doubt added a new array of sounds to the neighborhood to include the rhythmic chuffing of the 75 horsepower steam engine lifting loads of gravel into the dredge on a chain of buckets that no doubt permeated the air with an array of shrill squeaks. The gravel was deposited in a hopper seventeen feet above the deck where it fed into a 30 foot-long, rotating trommel, a hollow metal cylinder perforated with five to eight inch holes that separated the large boulders from smaller gravel. The clanging of rocks bouncing inside the cylinder must have sounded like a bell being hammered constantly day and night. The gravel from the trommel dropped into a device called a Hungarian riffle that separated the gold from the gravel and dropped the unwanted gravel into the pond behind the boat. The dredge had a steam driven dynamo that generated electricity for lights and made it possible to operate at night. One can only imagine what the dredge might have looked like in the dark with the glow of light surrounded by a haze of smoke and steam from the wood-fired boiler and the constant drone of the steam engine, clattering rocks, and strident squeaks of the bucket chain that no doubt could be heard for miles in the calm of the valley. Almost immediately after beginning operations the dredge began to have problems. Breakdowns were common and it was difficult to get it to work for more than 48 hours without something breaking. Each breakdown often took several weeks of waiting for parts to be delivered so repair work could be done, with the discouraging prospect that the machine would likely breakdown again 48 hours later. Damage was often significant and included the lower shaft on the digging ladder breaking several times, twisting of the main shaft, and the end of the digging ladder breaking off causing a great deal of expense in delays (16). In addition to breakdowns, maneuvering the dredge to where it could cut into gold bearing gravels was all but impossible. To find out why it couldn’t be turned, the water was pumped out of the pond using the 2,880 gallon a minute pump on the dredge. Once the water was gone it was discovered that the dredge was grounded on tailing piles from the Chinese operations that originally excavated the pit. This had to be dug away before the dredge could be turned and moved into position to begin excavation (16). Despite the problems with the equipment, the operator was able to dig a canal some 400 feet wide and about 600 feet long (5 – p213). Most of this was in an area that had previously been mined and the objective of digging the canal was to get to an area where they expected to cut into rich gold deposits. Just as they arrived at this location, the owners of the dredge and claim became entangled in a series of litigations that stalled operations to a standstill and spelled doom for the Josephine. The “Josephine” had finally arrived at the place where the owners believed it would begin digging into rich gold deposits when the owners entered into a lawsuit. The dredge fell into disrepair from neglect while the owners squabbled and capsized. The following is an attempt to reconstruct what happened using testimonials and evidence compiled in a 750 page trial document with bits and pieces of the story scattered among the pages (5). The company that purchased both the gold dredge and the Old Chinese Diggings mining claim in 1899 was called the English-Canadian Company, a corporation organized under the laws of Great Britain. They were able to operate and make purchases in the United States under a separate corporation, the Waldo Gold Dredge Company, a corporation organized under the laws of South Dakota (5). Under American corporate law, the mining claim needed to be in the name of an American citizen. This is why William Pearson, an American with legal power of attorney for the company, made the purchase with the corporation’s money but put the claim in his name. In 1899 the company commissioned a man by the name of Windell to recommend a gold dredge to be used at their Waldo mine. Windell claimed to be an authority on dredges but turned out to be a bookkeeper for a produce company who had worked four months on a dredge in British Columbia. 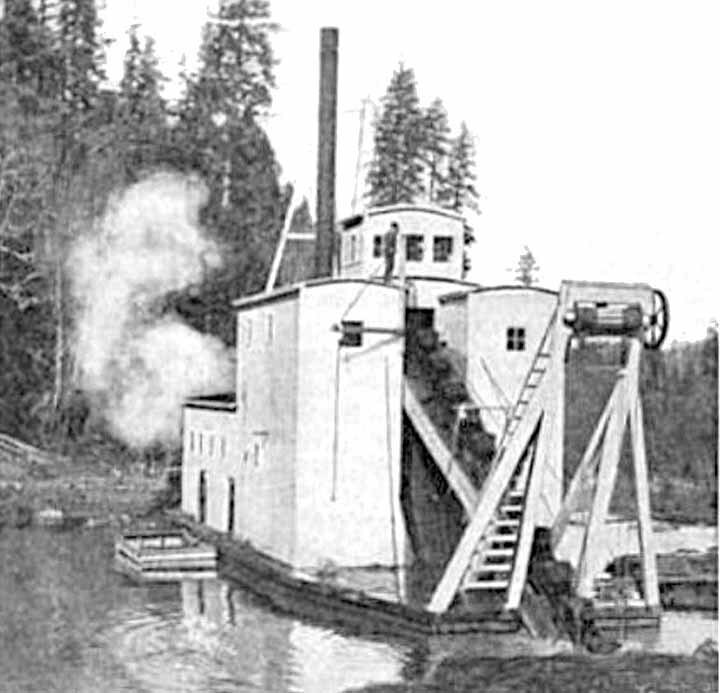 Windell selected a dredge made by the Hammond Manufacturing Company in Portland. The English-Canadian Company asked another associate, William Harris, to pay for it out of his personal money with the expectation that he would hold the dredge as a security until money from the company reached him. Windell supervised the assembly of the dredge but it quickly became apparent that he was completely incompetent in its operation. In early 1900 Windell was fired and George M. Williams was hired. When Williams arrived, he realized the dredge was not powerful enough nor of adequate construction to work in the boulder and rocky gravel of the Sailor Gulch flats. He recommended alterations to improve its efficiency but before these could be done, Harris asked the company to pay back the personal money he had spent to purchase the dredge. for parts and repairs. Eventually he returned to the company and demanded payment for the money he invested in the dredge and the cost of repairs. In late 1900, an investor named Van DeLashmutt from Spokane offered to lease both the dredge and the claim and this may have been what sparked a disagreement between Morshead and Pearson, both board members. In August, 1900, Morshead circumvented corporate law by holding a surprise meeting where he voted to remove Pearson as the corporation’s power of attorney and Morshead subsequently gave that responsibility to himself (5 – p304). Morshead returned to Grants Pass and met De Lashmutt in November of 1900 (15) and leased the claim to him for the sum of $37,925.35 for a period of about ninety days. The money was to be applied toward paying Harris for his share of the dredge (5 – p220). De Lashmutt then sent Harris a bill of sale for the dredge, although this apparently wasn’t part of the deal and no payment had been received by Harris. Morshead then filed a suit in December, 1900 in an apparent attempt to negate various debts including the one to Harris. The outcome of this wasn’t clear but a sheriff’s auction in July 1901, resulted in the “Josephine” being sold to Morshead (12). There was no mention of De Lashmutt. In the following year, Harris filed a suit against the company (14) for repayment of money he had spent on behalf of the English-Canadian Company to purchase the dredge plus other expenses. He eventually won but it was noted in the trial that the “Josephine” had capsized and, in this condition, was worthless. It is not clear what happened to the company and the individuals involved but the dredge lay in the pond undisturbed with all equipment on board to at least 1918 (6). It is uncertain what happened to it after this point. The bottom of the dredge faces to the left and a lift arm for the bucket-ladder faces to the right. Some of the buckets can be seen lying in the water. The other half of the boat is under water. Kerbyville Museum collection. 10) The Morning Oregonian, Monday, March 19, 1900, p8. New gold dredge successful in southern Oregon. 11) The Morning Oregonian, Saturday, April 14, 1900, p2. Mining on old ground. 12) The Morning Oregonian, Monday, July 1, 1901, p6. Oregon notes. 13) The Morning Oregonian, Friday, July 27 1900, p4. Illinois River placers will be worked with new appliances. 14) The Morning Oregonian, Friday April 10, 1903, p8. Court notes. Special thanks to Michael Oats for help and support needed to double check historical accuracy of this story as well as sharing information from his personal archive of this region’s mining history. 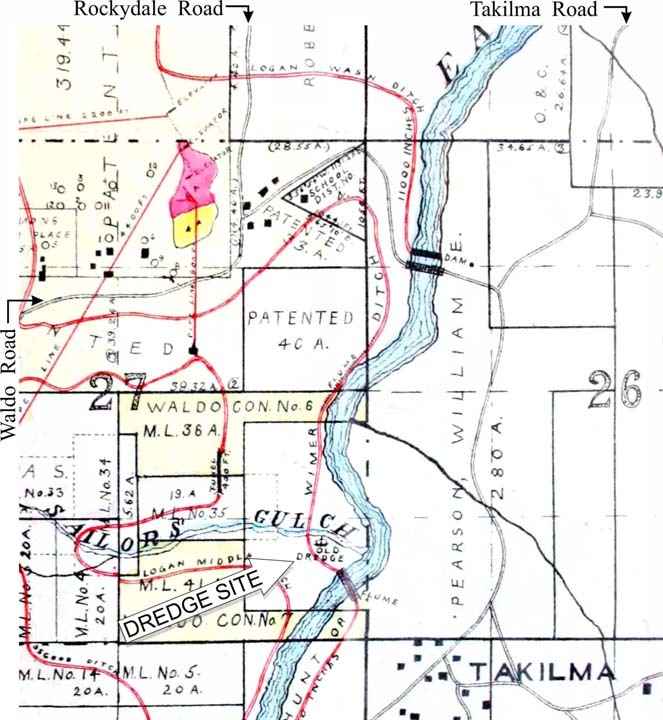 Greg Walters of Jefferson Financial in Cave Junction made a critical contribution with a 1911 map from his collection that showed the location of the dredge. Special thanks for Dennis Strayer of the Kerbyville Museum for finding a photo of the capsized “Josephine” and to the Josephine County Historical Society for photos and information from their collections and archives. Thanks also goes to Joy Werlink of the Washington State Historical Society and Larry Cebula, Associate Professor of History – Eastern Washington University for their generous assistance in locating information about William Harris, one of the key characters in this story, who was a resident of Washington.